NUVO Water Systems. Better, Healthier, Salt-Free Water. 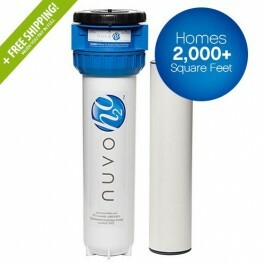 Robins Plumbing, Inc. is your preferred source for NUVO systems in Phoenix and valley wide. Enjoy better water, save money and prevent hard water build up. In Arizona, the water systems are considered “hard”. Due to the hard water, issues can arise in your plumbing. It can cause clogging, build up and in extreme cases it can corrode the appliances that the hard water runs to. A good water filtration system is necessary in Arizona, but they can also be extremely expensive. The NuvoH2O system brings salt-free soft water into your home without causing any more buildup. In actuality, it works to prevent the hard water from building up and clogging your pipes, extending the life of you plumbing system. It doesn’t remove any calcium from your water, and it also doesn’t remove minerals that are important to keep in your water supply. By lowering the pH levels in your water, and preventing minerals from forming scales, this system uses the power of citrus to work through those hard-water build ups, and utilizes the power of citric acid to bring refreshing soft water to your home. It is eco-friendly, and much less expensive than other soft-water systems. The NuvoH2O doesn’t require any additional salt-water pellets, and only requires attention from you to change the cartridge every six months. It comes in many different sizes, based on the needs and size of your home. This system makes your water extremely soft and fresh, without the harsh additives that other systems use. Not only will you spend considerably less on the NuvoH2O, but also, you will notice an extreme change in your water. Your appliances will work for longer without issue, and will have fewer residue stains from hard water. If you’re interested in the Nuvo water system for your Phoenix home or commercial business, get in touch with the professional plumbers at Robins Plumbing, Inc. Our team is well-versed in the various types of water systems on the market, and we can help ensure you choose the best water system for your property. We’re extremely knowledgeable about Nuvo Home Systems, Nuvo Manor Systems, Nuvo Studio Systems, and NuvoH20 Complete Systems. In addition to water treatments we also specialize in backflow prevention, commercial and residential jetting services, gas lines, faucet repair and replacement, and water heater repair and installation. To schedule your free estimate, contact us today.